Hudson Mohawk, recently referred to as HudMo, had a beginning in 1958. Mr. Atkins started attainment of the Charter in September, 1961, and unveiled the Charter at the January 1962 Business Meeting. The HudMo Section encompassed the eastern half of New York State. The city of Albany became the center of club business and activities with memberships as far south as Westchester County, east to western Massachusetts, north to the Canadian border, and west including Syracuse, Elmira and Ithaca. Active since 1972, the Finger Lakes Section in the western half of New York State included the Buffalo and Rochester areas, south to Dunkirk, Fredonia, and the Pennsylvania State Line, and north to the Canadian Border with some members coming from Ontario, Canada. In 1974, Mr. Everett E. Splatt became a member of the Hudson Mohawk Section and the following year accepted the office of President, a position held until 1986. Business meetings failed filling a full slate of officers, scheduling activities slowed, attendance became low, new membership dropped and the Charter was at risk. Change came in late 1986 when President pro-temp Splatt offered a warm welcome and encouraged replacement to his office. Finger Lakes Section Secretary/Editor moved east to the Richfield Springs/Cooperstown area and changed membership to the Hudson Mohawk Section under her remarried name, Sally Suffolk. A core group planned an organizational business meeting to reactivate the Hudson Mohawk Section on March 29,1987 in Fly Creek/Cooperstown. Members from near and far attended and a new slate of officers was elected: President/Editor: Sally Suffolk, Vice-President: Ann Fisher, Treasurer: Johnathan M. Newman, Secretary: James T. Santer. The National Business Office held a timely 'Name Your Newsletter Contest' that encouraged the title "Benz Bericht" created by the editor, and Honorable Mentions were received. New membership grew and monthly meetings were held at the Bavarian Chalet west of Albany although club events covered widespread locations throughout the Section. Sally became obsessed with Mercedes in 1982 when she and her mother answered an ad for a 1975 model 235, known as the German taxicab. She became practical and hesitated buying it, but her mother insisted she buy it. 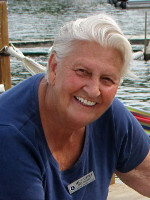 Her MBCA membership started in 1982 with the Finger Lakes Section which included western NYS and Ontario, Canada. She organized a number of events including rallies and was elected secretary, newsletter editor and president. The region was too large and ultimately HudMo was formed in Eastern NY. She received the award "Officer of the Year in 1985". Sally donated many of her records, newsletters and history to us to keep. ... Another past president of the club and friend of Sally's, Ann Fisher, joined us also. They both had many stories of past activities to tell us. This page last updated at 18:55:56 EDT on September 26, 2018.